The Mounted Patrol Unit (MPU) was established in January of 2010 as an operational police unit. The officers receive a Basic Equitation riding course from the Toronto Police Service where they are educated on horsemanship, riding skills and roadwork. The mandate of the MPU is to offer high visibility policing, crowd management and active crime prevention in the City of Hamilton. The MPU also works closely with the Police Services’ Action Team to respond to areas identified by hotspot analysis that require focused proactive patrol. 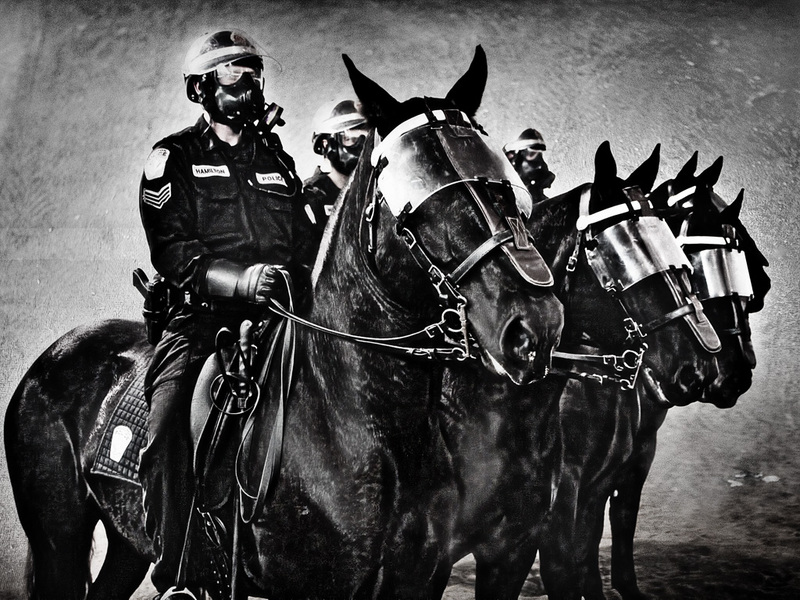 The MPU consists of 5 horses, 4 full time officers and 4 spare officers in order to ensure year round coverage. The Unit deploys 8 shifts per week, covering; day, afternoon and night shifts. The horses are all Percheron and Percheron-cross geldings which stand between 17'3 and 18'1 hands high (about 6 feet tall at their withers). Barron - Constable James Barron, in 1903 was the first Hamilton Police Officer killed in the line of duty. RHLI - Royal Hamilton Light infantry, pronounced Riley. We support our troops!